Logic takes two inputs (I0.0, I0.1), debounces each (T0, T1), looks for actuation during a timed period (T2), and provides validation (M20.0). This logic is not designed, nor intended, to replace the use of any OSHA required two-hand safety control relay. It is provided for the sole purpose of it's educational value. I sometimes need to scale an analog value, so I had to do a function to better suit my needs than Siemes "Scale" function. It has 5 inputs, all in integer format. _In_Min - Lowest value of the "_In" signal. _In_Max - Highest value of the "_In" signal. _Out_Min - Lowest allowed value of the scaled output. _Out_Max - Highest allowed value of the scaled output. The output "_Out" is the calculated value in integer format. It's saved as a global library. In the matrix A [ i , j ] put the System of N-Equation. Sample code for Parsing Strings - in this case taking incoming comma separated variable strings and breaking them apart. No usage of "reusable code". PDF: Reusable code with FBs. Example of how to create reusable code by means of Function Blocks and the associated Instance DBs.<br /><br />Note that it has been printed in LAD (ladder). <br />Some code cannot be viewed in LAD which is why it defaults to STL (statement list). This program is a little modified version of the earlier traffic code. This program also has the comments added which was missing in the earlier version. This is a simple program to paint an object while the object is transferred from Station A to station C. The painting occurs in station B where the object to be painted is stopped and dipped in paint and the moves further to C. From C the transport system comes back to A without stopping on its return path at B. If you have any doubts or suggestions please feel free to contact me . This is a simple program where the drill arm moves down for the drill and the Drill motor starts as well. The drill arm stops after reaching the bottom level but the drill motor continues for a few seconds to ensure a good drill and then stops. Now the Drill arm moves up again and then reaches the top position and starts the cycle again.It is aslo ensured that the Drill arm is always at the top before the operation starts or if the drill operation is stopped in midway. If you have any doubts or suggestions please feel free to comment. This is a quick sample program to demonstrate how to make the PLC adjust the clock for daylight savings time automatically. It's done with an S7-200 but the logic sould be similar for any PLC from any vendor. This file for Siemens 200 PLCs will create a rolling average of the last 100 scans worth of an analog input. Control program for a web splicer. Cut off knife example program. 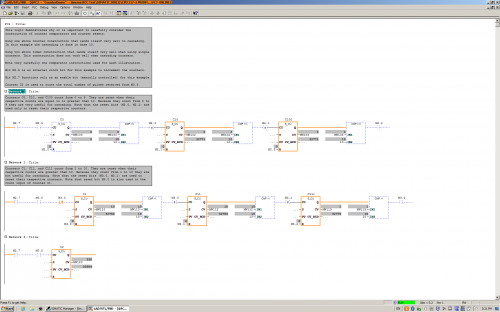 Uses Profibus communication and indirect addressing examples.